to supply any additional information you may require. 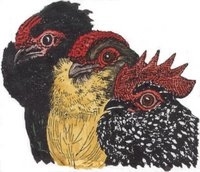 You will also find a full copy of the Australian Standard for Belgian Bantams. This Standard is also published in "Australian Poultry Standards - 2nd Edition"
time there is something new to add. Please feel free to contribute information or photos . information if you are willing to look for it. Our membership year runs from 1st June to 31st May. Full adult membership (single, couple, family or group) is $20-00. Junior membership (up to and including 16 years) is $10-00. A little bit about Us - who are we? The contents of these pages will always remain the property of the Belgian Bantam Club of Australia Inc. The material contained within these pages may be used for the purposes of private study, research, or to further pass on this information as permitted under copyright legislation, but only if the source is fully credited at all times. No part may be reproduced or re-used for any commercial purpose without the written permission of the Belgian Bantam Club of Australia Inc. Further no modification to any of the information may be made without the prior written consent of the Belgian Bantam Club of Australia Inc.